According to USA Today, Saugatuck is one of America’s “Best Summer Weekend Escapes” but locals and frequent visitors know that the area offers fun all year round. The area is known as Michigan’s Art Coast and here many artists, families, couples, and friends enjoy the beautiful grassy dunes, white sand beaches, fun festivals, and stunning fall colors. For years, visitors have come from all over the country to relax at this small town, and below you will find reasons why people continue to flock here in every season. Shhhhh! 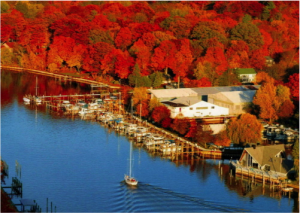 Not many people know this, but Saugatuck is actually considered the prettiest during the fall by many! The foliage is amazing, just look at that picture! And although it may be a bit too chilly for the beach, there is still a lot to do. We suggest going on a few brewery tours through the Saugatuck Brewery Co, which hosts tours every weekend. During the tour you will get to taste many beers, receive a free pint, and get an up close and personal perspective on the brewing process. You might even be inspired to start your own homebrew during your long winter hibernation. If you’re trying to choose a good weekend to visit, you may want to consider coming for Fall Fun Fest or the Halloween Harvest Festival. Both events offer great season-appropriate diversions like pumpkin carving, costumes, a huge pumpkin slingshot, a pie-eating contest and, of course, local music and food. In the winter months, Michigan can get pretty cold, so put on a coat and get ready to enjoy yourself because Winterfest is coming. No, we’re not talking about Game of Thrones, we’re talking about Saugatuck’s famous Winterfest. This fun festival takes place over the weekend closest to Valentine’s Day and offers exciting activities through the snow parks, wineries, bars, art galleries, and shopping districts. Snow sculpturer and Stew & Brew contests take place as well. If you’ve never been to a Stew & Brew, you’re in for a real treat – the event features locally-brewed winter beers, live music and local chefs competing for the best stew. 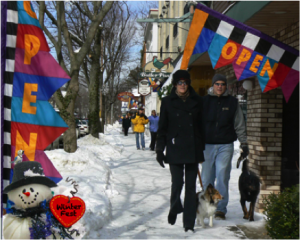 Even if you can’t attend Winterfest, you can come at any time during the winter to take advantage of Saugatuck’s many parks that are absolutely ideal for sledding, cross country skiing, and ice-skating. And of course, the bars and wineries are always open if you’d like to relax somewhere cozy while looking out at the pretty winter wonderland. Ah, Spring…the ice melts, the temperatures rise and the flowers start to show their faces. The Saugatuck area is the perfect place to enjoy the season of renewal. You may not be able to jump into the water quite yet, but on a brisk sunny day, you can still enjoy spending time there. Pack a picnic, a couple of blankets for cuddling and enjoy finally feeling the sun on your face as you watch the waves crash against the shore. If you’re a runner, come visit in April to take part in the Saugatuck-Douglas Town Crier 5K and 10K Run. And while you’re here, enjoy wine events happening for the annual April Michigan wine month. In May, you can attend celebrations like the Annual Derby Day Celebration and the Tulip Time Festival. As you can see, the spring is chock full of fun events that help reign in the busiest time of the year for the area. 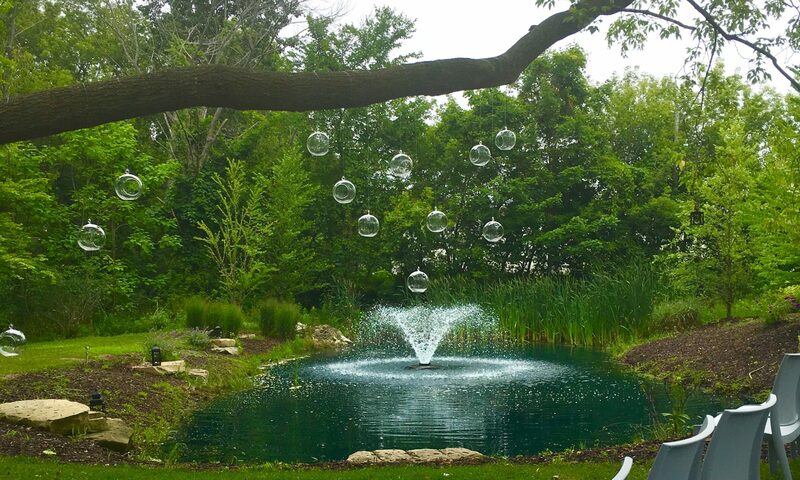 No matter when you visit, you’ll find that Saugatuck-Douglas boasts a full calendar of organized events and natural beauty to enjoy. Book your off-season stay any time – we’re always here to help you enjoy the beauty of the Art Coast.